How do I get rid of fruit flies in my garden tower? 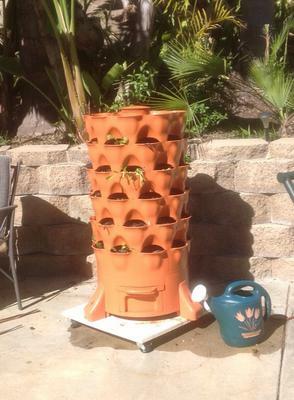 I bought one thinking the compost tower would be great but I'm a beginner and I don't see any of my worms. However I do see fruit flies. Too much moisture? The collection basin is smelly so I put vinegar in the basin. Hopefully I will drown the flies?? Ok, I did the vinegar basins but that does not seem to work....help? Can I put DE in the compost column? Fruit flies and other pesty organisms will usually get out of control when there is too much Nitrogen (kitchen scraps) in the center composting tube. The best way to avoid this issue or be proactive is to stick to the 20:1 C:N (carbon:nitrogen) ratio. 1. Create more air flow/oxygen to the microbes and worms. If the tube has too much nitrogen it smothers the organisms and cause anaerobic conditions. This is accompanied by a foul odor and the smell of bad microbes. This will not harm your plants but the worms are not benefiting from these conditions. 3. Prevents flies from coming back due to NO smell emitting from the system. One thing to remember is that the carbon material is worm food as well but just like in nature a balance is needed. Here's what you can do now. 1. Remove any large chunks of nitrogen as possible, only what you can reach within reason. 2. Adding a few sprinkles of "food grade" DE I'm not really sure would work. The system remains constantly wet or moist and DE is ineffective when wet. Sprinkling just a little on top inside the tube will not hurt though. Just not my first remedy. 3. Add plenty of moist carbon (any or all of shredded newsprint, paper, cardboard, coco coir, etc) on top inside the center tube about 3-6 inches. This will lock in the smell emanating from the tube. 4. My Buddy, Thomas Tlusty (a project partner) also suggests slipping a nylon stocking over the top to prevent flies from getting into the small holes and laying their eggs. The only thing I'm concerned about is if you put a stocking over it then it will lock in the existing flies. This will perpetually increase the fly problem. The flies will hatch and mate, hatch and mate. It could get worse. It may be best to place the stocking on after the fly issue is remedied as a proactive measure. 5. Due to the acidic low PH level of vinegar, I would definitely toss out the leachate in the bottom of the system. Don't worry about nutrient loss. Believe me, you have plenty of nutrients in the Garden Tower and you are continually making more. 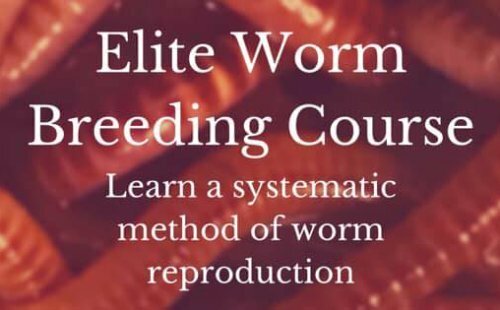 Worms do not like a a low PH environment AND fruit flies are extremely attracted to vinegar. This is how we bait them using apple cider vinegar traps. This is also why they are attracted to the rotting kitchen scraps. Always bury the kitchen scraps well under a few inches of moist carbon material. I'm not sure if your Garden Tower is indoors or out doors. If indoors follow the directions in the link below. Setting traps outside will only attract flies from afar and not just the ones in the Garden Tower. If you poured any vinegar into the Garden tower then I would recommend doing one flush of the system and then toss it out of the collection tub underneath.